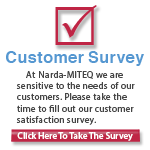 L3 Narda-MITEQ manufactures and designs one of the most extensive Frequency Oscillator product lines on the market today. 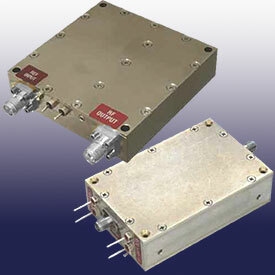 L3 Narda-MITEQ's standard oscillator product line includes: high-value phase-locked coaxial resonator oscillators, phase-locked coaxial resonator oscillators, fundamental/multiplied phase-locked coaxial resonator oscillators, lowest noise phase-locked dielectric resonator oscillator, ultra low-noise phased-locked dielectric resonator oscillators, variable frequency multi-source oscillators, phase-locked coaxial resonator oscillators, multiplied phase-locked coaxial resonator oscillators, phase-locked crystal oscillators, ultra low-noise crystal oscillator, multiplied crystal oscillator to 1 GHz. L3 Narda-MITEQ also offers a product line of free-running Dielectric Resonator Oscillators which includes mechanically-tuned dielectric resonator oscillators, temperature compensated dielectric resonator oscillators and electronically-tuned coaxial oscillators.